A new Chandra image of M51 contains nearly a million seconds of observing time. The data reveal hundreds of point-like X-ray sources within what is nicknamed the "Whirlpool Galaxy." Most of these point sources are X-ray binary systems with either a neutron star or black hole orbiting a Sun-like star. 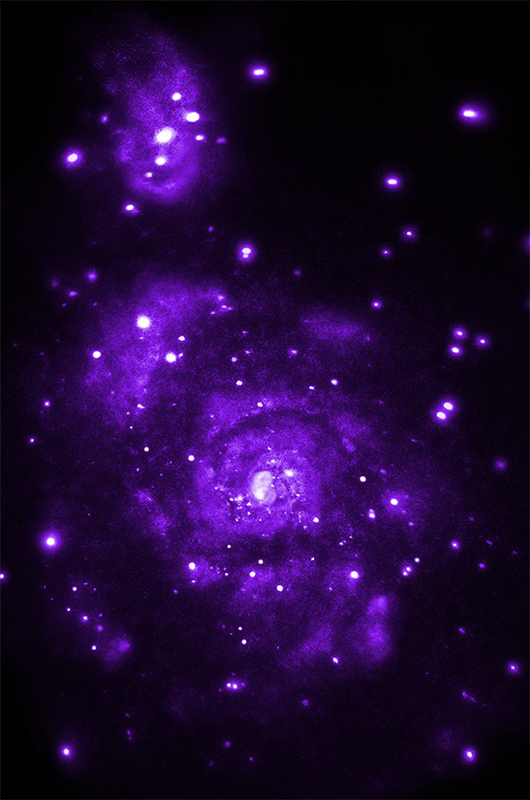 The composite image consists of X-rays from Chandra (purple) and optical data from Hubble (red, green, and blue). A difference between the Milky Way and the Whirlpool galaxy is that M51 is in the midst of merging with a smaller companion galaxy seen in the upper left of the image. Scientists think this galactic interaction is triggering waves of star formation. The most massive of the newly formed stars will race through their evolution in a few million years and collapse to form neutron stars or black holes. Most of the XRBs containing black holes in M51 are located close to regions where stars are forming, showing their connection to the oncoming galactic collision. 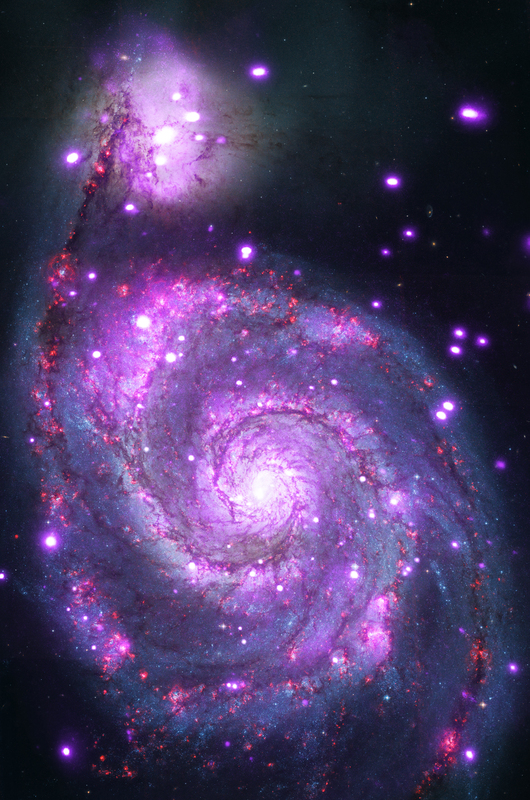 Previous studies of the Whirlpool Galaxy with Chandra revealed just over 100 X-ray sources. The new dataset, equivalent to about 900,000 seconds of Chandra observing time, reveals nearly 500 X-ray sources. About 400 of these sources are thought to be within M51, with the remaining either being in front of or behind the galaxy itself. Much of the diffuse, or fuzzy, X-ray emission in M51 comes from gas that has been superheated by supernova explosions of massive stars. The new Chandra observations were presented at the 224th meeting of the American Astronomical Society in Boston, Mass. by Roy Kilgard of Wesleyan University in Middletown, Conn. NASA's Marshall Space Flight Center in Huntsville, Ala., manages the Chandra program for NASA's Science Mission Directorate in Washington. The Smithsonian Astrophysical Observatory in Cambridge, Mass., controls Chandra's science and flight operations. Coordinates (J2000) RA 13h 29m 55.7s | Dec +47° 1330´ 53"
Observation Time 232 hours 10 min (9 days 16 hours 10 min). Amazing pictures. Thank you NASA. What is the Angstrom measurement of the wavelengths this image is visible in? Why not take this in UV or radio? This is an amazing explanation. Information like this helps people put their lives into perspective, showing how vast the universe is. Life is ever-changing, there is no stopping it. It is nice to sit back and see how things change. Thank you NASA. A marvelous photograph followed by a most comprehensive explanation. Awesome glimpse of bigger reality. A spiral galaxy 30 million light years from Earth. About 30 million light years. X-rays from the Chandra X-ray Observatory and optical from Hubble Space Telescope. About 52,000 x 87,000 light years. In the constellation Canes Venatici in the Northern Hemisphere.